Persien nach seinem neuesten Zustande in das Ostliche und Westliche Reich eingeteilt. 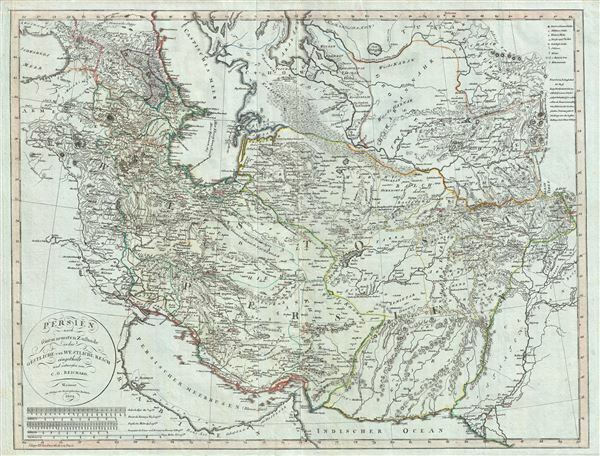 A fascinating 1804 map of Persia by Christian Gottlieb Reichard. It covers from the Black Sea south as far as the Persian Gulf and east as far as Punjab in India, including the modern day nations of Iran, Iraq, Georgia, Armenia, Azerbaijan, Turkmenistan, Afghanistan and Pakistan. The map identifies numerous towns, villages, deserts, mountain ranges, river systems and a host of other topographical features. The map is color coded according to territories and boundaries. The map curiously divides the country, as the title suggests, into the Eastern and Western Empire, suggesting suspicious political evidence. Furthermore, the islands in the Persian Gulf are also erroneously shown as independent territories, suggesting political aspirations of the time. The map represents Persia under the Qajar Dynasty. In 1794, Aga Muhammad Khan of the Qajar Dynasty overthrew Loft Ali Khan, the last Shah of the Zand Dynasty, and relocated the capital to the new city of Tehran. The subsequent era, the Qajar Dynasty, witnessed numerous military conflicts with the rising powers of Imperial Russia and the loss of much of Persia's territory. A legend is included in the upper right quadrant of the map. This map was issued in the 1804 edition of Christian Gottlieb Reichard's Allgemeiner Hand-Atlas der Ganzen Erde. Christian Gottleib Reichard (June 6, 1758 - September 11, 1837) was a Weimar based German cartographer active in the late 18th and early 19th centuries. He was educated at the Lyceum of Schleiz, and studded law at the University of Leipzig. Reichard developed an early interest in geography, drawing, and music, which he continued to develop throughout his life. His first cartographic project was a globe made for his children, which attracted the interest Baron Franz Xaver von Zach in Gotha. With Zach's support Reichard delved more fully into cartography, publishing several important works early in the 19th century focusing on the discoveries of Mungo Parke, Rennel, Lander, and Alexander von Humboldt. He also supplied several charts to the Homann Heirs firm. Along with Adolf Stieler and the Perthes publishing companies, he collaborated on the first Stieler's Handlatlas. Published between 1817 and 1823, the first Stieler's Handlatlas proved to be a long lived and influential work that continued to be revised and updated well into the 20th century. In addition he also published several general and historical atlases on his own account between 1803 and 1824. Reichard, C. G., Allgemeiner Hand-Atlas der Ganzen Erde, Weimar, 1804. Very good. Minor wear and creasing along original fold lines. Original platemark visible. Blank on verso. Alai, C,. General Maps of Persia 1477 - 1925, E174.